The Siege at Ruby Ridge is a 1996 docudrama television film directed by Roger Young and written by Lionel Chetwynd about the confrontation between the family of Randy Weaver and the US federal government at Ruby Ridge in 1992. It was based on the book Every Knee Shall Bow by reporter Jess Walter. It originally aired as a two-part CBS miniseries entitled Ruby Ridge: An American Tragedy on May 19 and May 21, 1996. 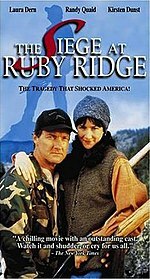 The miniseries was edited together to become the film The Siege at Ruby Ridge. ^ a b Suprynowicz, Vin (1999). "The Courtesan Press, Eager Lapdogs to Tyranny (Chapter 6)". Send in the Waco Killers: Essays on the Freedom Movement, 1993–1998. Las Vegas: Mountain Media. ISBN 9780967025902. ^ Hal Erickson, "The Siege at Ruby Ridge - Overview", allmovie.com, 2007. ^ "1997 Awards". pressacademy.com. Retrieved January 3, 2013.